He feels that perhaps he was brainwashed as a child, “My upbringing seemed to be one of training me out of being intuitive and having emotion.” AND he would like to literally “run away and join the circus” and use his Physical Therapist skills in a new arena. AND he’s got a family reunion approaching and is looking for advice about seeing an older brother who he’d rather not see. “What about people wanting things that the majority of us think is not a good thing?” A discussion about ‘good’ wants vs. ‘bad’ wants and a look at all the laws we have and why we have them. “Why do we leave pure positive energy to lead a material existence?” AND “I sold my home and put my things in storage to minimise my expenses so I could become more of the solution rather than the problem as I saw it in working in Corporate America.” But her path doesn’t seem to be getting any clearer. “Ha, ha, ha, ha, ha!” begins Jerry with a mischievous laugh. “We’re basically here for the fun of it. Anything else that is going to happen will be up to you folks!” A look at all the wonderful kibitzing that takes place between Jerry & Esther during a typical workshop. …I have been watching this multiple times, first me, then my wife, then my 18 year old son, and this weekend with friends. 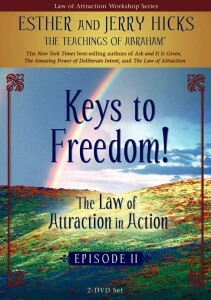 The depth and clarity of the teachings is wonderful. The selection of topics is superb… What a wonderful teaching tool. …Each time my husband & I watch this video, we hear something profound. Here are the answers to so many questions we struggle with, such as war, peace, and how to follow our inner guidance. We loved the family reunion story that illustrated how to accept people as they are. We really related to the answer about what it really means to “do something of service and give back to the world.” We were delighted with Abraham’s humorous remarks as they lovingly answered so many serious questions. The bonus clip of The Court Jesther was a hoot! Wow (California) … there’s something wonderful about being able to see Abraham speaking through Esther, and that’s why I love this DVD. Ah ha! (Miami) … More episodes…..give us more. The water of life. I have looked for spiritual wisdom that really fit all my life. This is it for me. Episode II DVDs (California) … An amazing DVD. 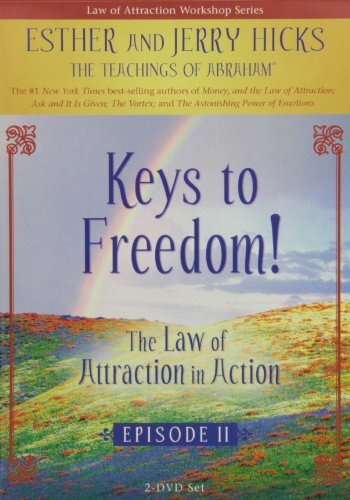 I highly recommend these to all those interested in Law of Attraction and creating a better life for themselves. Our Wonderful Abraham! (California) … I love this DVD… I just adore watching Esther. I love the hand movements… even her bare feet on her lovely little rug!